All golfers experience low back pain from time to time. For most of us, the pain isn’t serious and can be resolved with a routine exercise program. Recently, I asked all of the family of Twitter followers (@GetFitForGolf) if they had any back injury problems. Fortunately, we do have a few followers out there and they sent in a lot of questions. Fortunately, I ran across a good friend of mine at a conference in San Diego when I had back pain issues. My pain was weird, I could tell it was caused by my weak back muscles but the pain ran down my hip. My friend is Ian Hart who offers back pain relief at his gym EarthFit. Ian also has an online program you can grab that takes about 20 minutes to run through at BackPainRelief4Life.com. I was able to talk Ian into a Skype call with the promise there would be donuts in it for him (just kidding).. The interview has some great nuggets that I hope help you out. If you do not experience pain and are looking to prevent low back pain and injury, I’ve merged some of the concepts I learned from Ian as well as strengthening exercises for the core in my newest workout – Back and Abs for Golf which will be released this coming Fathers day weekend. 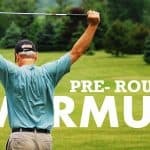 Either program is guaranteed to add years to your golf game. The important thing is taking action and doing something about your back pain or taking the initiative to protect your back against injury. Below you will find the actual video interview (poor quality I know) along with a written transcript just in case you can’t handle the crappy video. The audio is a bit garbled at times, so I hired my gopher to transcribe it all for your convenience. The last thing we want you doing is an exercises called the Rotating… static… static… garbled… Chin… garbled…. Hey, it’s my first attempt at doing a recorded Skype Call. I think next time I’ll hire George Clooney to play me..
Christian: Hi! 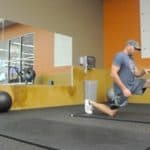 My name is Chris and I am with getgolfit.com and I’d help golfers to hit the ball further and improve their consistencies as well as help reduce injuries. I am speaking today with Ian Hart… and Ian, why don’t you introduce yourself? Ian: Hey! How’s it going? I am Ian Hart here I am the owner of EarthFit personal training and also co-creator with back pain relief for life. We also have a blog and product at BackPainRelief4Life.com. Christian: Great! A little bit of history about Ian and I, we met in San Diego. We’ve actually met a few times… but in San Diego, I was having some low back and hip pain. We were at a conference and speaking there “Hey! Why don’t you come over to the hotel where I’m at and we’ll hit the gym there and I’ll work with you on your hip issue?” After the therapy that Ian gave me, which lasted about 20-30 minutes, I felt fantastic! I’ve been doing his recommendations for about 2 weeks now and I can tell a huge improvement in not only my hip, but my low back. So, Ian why don’t you talk a little bit about what my issue was and how you helped me resolve it. Ian: Obviously knowing your background and speaking with you a little bit, you know you’re a golfer, anytime you had a repeated movement or repeated stress; it’s going to cause issues. 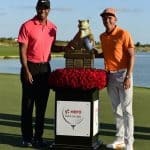 You know as you’ve seen all the golfers out there which is you know why Tiger Woods had knee surgery. All these other issues that golfers have but your torturing you’re hip and your low back repeatedly and you’re always hitting from one side. So it’s repeated movement, there’s going to be a little stress, scar tissue and muscular imbalances. And anytime there’s a repeated stress, there’s always going to be muscular imbalances. Basically, that’s going to lead to compensation of movement and it’s going to lead to dysfunction in movement and it’s going to lead to pain eventually. Sometimes it doesn’t lead to pain but there’s still a major problem. You obviously had pain and wanted to get rid of it so we targeted those muscles that you had issue with and opened up that area and took pressure off of those joints to allow more blood flow, oxygen, nutrients to get to that area so you could recover and heal and then move better. Christian: I noticed I had a knot, like a muscle on my hip was knotted up but since I’ve been doing the program, I don’t feel that knot anymore. Ian: That’s common. When people get knots in their body, it impedes the flow of energy, low blood and nutrients and you like to say you have an analogy of internet connection, right? So, if you have knots in your body, it’s going to prevent that energy from flowing. It’s like a lot slower right? Sometimes, it’s worse than dial-up. They are just completely blocked and you’re not getting any connection. So we want high-speed internet access obviously. What we do, we target those areas that allow electricity to flow. Human beings send impulses from our brain to every part of our body. We want that connection to be fast and fluid especially for golf; where you have full body movement like that it just has to flow properly. If you have those knots; there you’re trying to hit the golf ball, you’re going to compensate and cause some pain somewhere in the body. It’s either going to be in that area where the issue is. A lot of times it end up somewhere else like some have hip issues that end up in knee pain or ankle issues they end up knee pain, vice versa. We want to breakup that knot, loosen up the area and then that allows kind of stretch the tight muscles, strengthen the weak muscles that allow blood flow and get that internet connection moving really fast which is why it is almost like you are high on pain pills, right? Christian: Actually, I was going to mention that but it did feel like I had a few beers. I had a little kind of a buzz going on after the exercise routine. I never experienced that before. Ian: That is just more oxygen, nutrients and activation of your nervous system and that’s how the body should be in effect, right? It’s like full connection and you had impedance there so you just opened it up and right away. Boom! The brain and connection is there and you’re automatically feeling better. Christian: It was amazing! I have a quite twitter followers here and I’ve got some questions from some of my followers and I was curious if we could get some answers to their questions? I’ve got a question here from TJ says here he’s 35 had a laminectomy at 28 years age, chronic pain down his left leg and hip and he is always stiff. He says nothing helps. Do you have any advice for him? Ian: I’m sorry to hear that he had back pains at such a young age and surgery already. Usually what happens is again he probably had compensations somewhere or dysfunction and some atrophies around the lower back, the lower spine and you’re putting lot of pressure on the disks or maybe there’s some trauma there which cause the disks to probably protrude and hit the nerve or something. I’m just assuming why he needs surgery. Again, it’s just an assumption but yeah there are definitely a lot of things. We have people come to us all the time who are in same situation, who want to prevent that surgery and what we do are some specific movements that helps take pressure off of the disks and again allow more blood flow and oxygen so that area connection be recovered. The spine is vital in getting nutrients to the rest of the body and there’s nutrients that comes through the synovial fluid of the spine and what we do is we open them up; we would stretch the tight muscles. It is tough for me to say specifically since I cannot talk to him but we stretch the tight muscles, strengthen the weak muscles and then allow for a little bit of compression on the back in certain way. It sounds like for certain people compression that allows more nutrients to get into that area. There’s doubt that compression in synovial fluid that gets into the spine that actually doesn’t get in to the lower back. Also, it activates those muscles that support the spine because if those muscles are atrophied then you’re not supporting the spine way it used to be. You’re not going to work on each of those muscles that support the spine. You’re going to end up putting stress, more stress on low back that makes sense. Christian: Yeah absolutely. Would any of the exercises that you had me do in San Diego, would those help? Ian: There’s this specific exercises for strengthening the lower back and also the hip, opening up the hips. With that said, there are exercises that certain people should do and shouldn’t do. Sometimes they see people do side twists or bends stuff like that, you might want to stay away from them because first up, you’re doing golf and probably been doing enough twisting anyways. That’s not generally not the time to do that twisting which is why it is more important to have strong muscles that support the back and get that stronger and stronger to training properly. Christian: Great! I have another question. Brian Smith has severe back sprain. He had an MRI taken and it is negative. He’s started therapy. Are there any other suggestions that he can do? Ian: I don’t know how he sprained it and what he did. We have tons of similar situations. You said MRI was negative? Just like I said that sprain probably occurred because he compensated the movement and the muscles were not strong enough to support his movement that he do so and we see this happen a lot. Christian: I have another question from a high school golfer where his lower back is tight and kills after every round. Do you have any tips for loosening that up? Ian: Yeah I could tell like 2 specific but first up before you want to stretch, he should warm up before and after golfing… you are not necessarily warmed up. It should be more of a warm up with added sweating and breathe in a little heavy so you get more oxygen to the body. But specifically there’s 2 stretching that they can do where its kind of like the butterfly stretch. Just like with one on one we did with you. You get that butterfly position, wrapped and posed and keep your back straight and pull yourself forward and that is going to help take the pressure off of the lower back and stretch that area. Also, it is like the sit and reach, feet together, legs extended reaching for the toes and same thing, kind of pull the lower back towards the toes and then full support towards the knee. I can send you some pictures if you want of those stretches. Christian: Sure that would be great! You are not rounding your back, are you? Ian: You are going to round your back to a certain degree. You might want to kind of pull it forward and push your head down. It kind of seems counterintuitive cause a lot of times you’ve been told have a straight back and that’s true when your lifting things and you’re picking stuff off of the ground. But this is very specific movement or actually taking stress off of the lower back. Also, with that said, he probably has a weak back so stretching will help to some degree but rarely again, I just assume, making an assumption, thought he needs to strengthen that area around the spine. Christian: OK, I have another question from Sam, looks like he has a bulging/slipped disk. He’s working with the chiropractor. He does not want surgery and would like to strengthen this area, any suggestions for him? Ian: Yeah.. Chiropractic can be beneficial to a certain degree. For the most part it is usually muscular that’s causing the issue and this is true for about 85 percent of people that have severe back pain, those muscular imbalances, the issue and stress due to trauma. So manipulation is only going to go so far severely against strengthening and stretching certain muscles to correct muscular imbalances. I had him here, I would ask him or take him through some body tests and see where he is at and make suggestions from there. For the most part, a lot of people have very tight inner thighs and weak outer thighs or glut medius which is part of the glute muscle that does moving the leg outward. That would be a place to start maybe look that and again I would probably wrong. I just keep telling you what we see a high percentage of. I presented there and just right away specific movements, stress off the back and again taking pressure off the disks including the disks, the spine and alignment will allow the disk to pop right into the proper place; to thwart of surgery.. and not only thwart of surgery but to be pain free which is even better. I lived through back pain for some time too, and that’s kind of why we got in to this business. Christian: I can’t even imagine trying to play golf with a slipped disk. It seems like it is extremely painful. Ian: It’s no fun at all and all especially with the powerful movements that you need to strengthen to swing a golf club. Christian: Good stuff. Can you tell the viewers a little bit more about how they can get this information, to start these programs? Ian: The program that we have is called “Back Pain Relief for Life”. 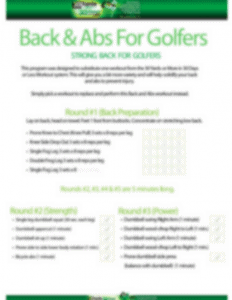 The program is specifically for golfers. We actually work for a lot of golfers on this. We actually thought about of turning one into a specific golf product because we have had such success with it. But currently it’s just called “Back Pain Relief for Life” exactly. Actually, that is backpainrelief4life.com. It’s where people can read more about the program and be able to see some of the people that we’d helped. And like those people you had with the questions, they don’t sound bad off compared to some of the people we see here.. we have people who couldn’t walk so those people actually sound they are in a better position than a lot of people we’ve worked with. You know, people literally couldn’t get out of bed that were told that they can’t even do cardio again, they should never play sports again, you should never do this again. These people were told this by physical therapists, spine specialists and then they come in and 3 weeks later they’re given a new freedom because we target the root cause. A lot of times people go through these specialists and they’ll get a laminectomy, they’ll get injections or take medications but that doesn’t solve the root cause of the problem. It is really just a band-aid and it’s why people are not getting better, they are not getting relief. It’s just a band-aid. You want to target the root cause of the problem so that’s what we created: A program that targets the root cause of the problem. Again, we are in America, people want fast and easy result. This program not only gives you fast and easy result on the other hand of it, it’s not like taking a pill. It’s like taking a pill in a sense that after your done with the workout, you felt like you took a pill. Christian: It did feel like I’d taken the pill. Ian: Literally, when you do the program it’s like medication for your back. It’s literally like taking medication for your back which neurotransmitters, all the chemical process; it puts that into your back and into your brain. That’s why your mind body connection, you see relief right away. Two days later, your body will recover and get stronger and better. Christian: It was fantastic! I was in pain all that day and after the BackPainRelief4Life.com program I was able to sleep nice and comfortable. It was fantastic so I would highly recommend backpainrelief4life.com. Thank you Ian for speaking with us and I hope the viewers enjoyed this and can put some of this to use. Ian: Thanks for having me. I appreciate it. If you’ve made it this far, I can assume you are needing some attention on your back. If that’s the case then head over to Ian’s website and order his Back Pain Relief For Life program. 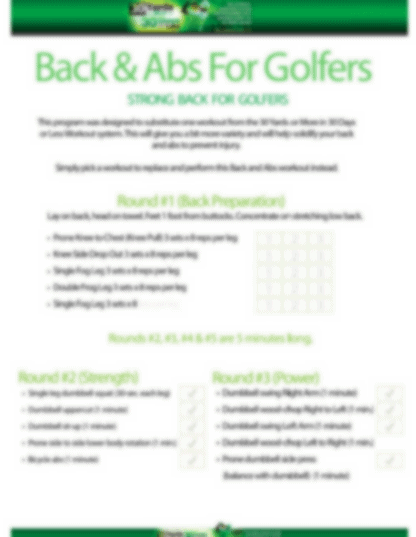 If you are interested in preventing back pain, stay tuned… fill out the box to the right of our site with your email and we will send you info later this week on how to pick up the new Back and Abs for Golf.